After an absence of nine years without heavy snow we awoke for the second time this year to a snowy Sunday! There was something quite calming just sitting with a mug of coffee in our hands, watching the snow flakes fall in time to some Irish music from The Gloaming, playing in the background, while the smell from the oven of roasted squash, sweet potato and garlic tantalizing our taste buds! Again we watched in amazement as thousands of birds swooped over the fields nearby, a few of them landing in the willow hedgerow and the garden, so we could get a closer look. 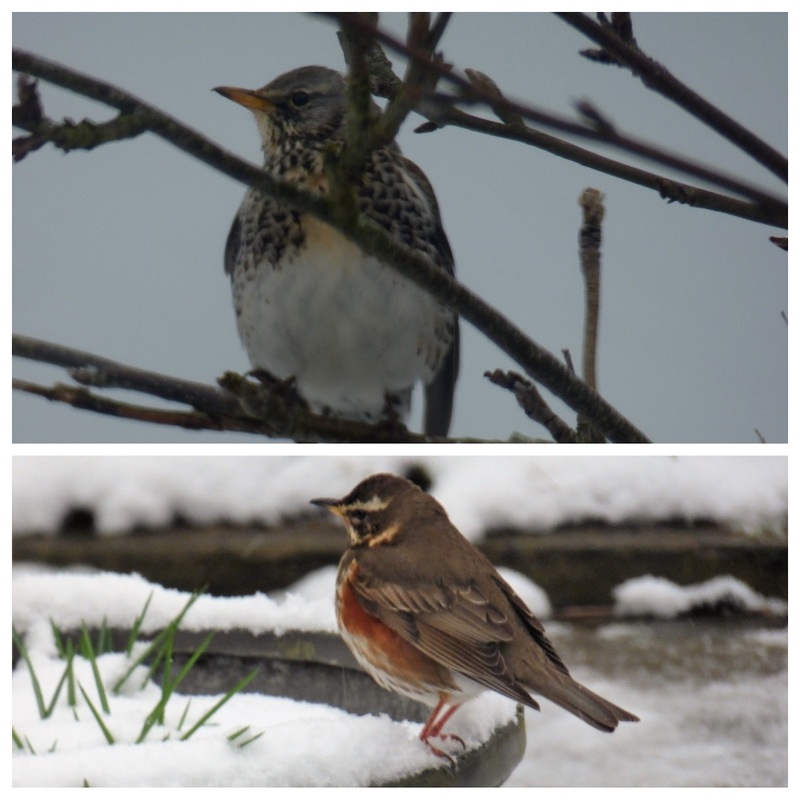 A friend who is a keen bird watcher stood on the coast path nearby for 6 hours and counted 24,000 Fieldfares, 7,000 Starlings and 16,000 Redwings fly by! When the snow stopped we ventured out to walk the dog and noticed that some people were enjoying sliding down East Cliff. Having snow covering the beach is such an unusual sight! I caught my first cold of the winter this week, which completely sapped me of energy. It has been frustrating to not achieve all I had planned, but with lots of lemon, honey and steam inhalations I am almost back to normal. Hope the weather doesn't affect your life this week, until next time. The first photo is beautiful, the way you captured the falling snow! It was 55 degrees today and I worked in my yard all day cutting away the dead perennials I'd left last Autumn. My yard is nice and tidy now for the SNOW we are to get on the first day of Spring! Watching the snow falling can be quite calming. So much of it for months tests one’s patience. Love the bird shots, Sarah. The snow must be a shock to them! I love your pictures! What a beautiful day and perfect way to spend a snow-day! I'm envious! :-) But I hope you feel better, and have a good week! Take care! Oh that pink house! I hope you feel better soon Sarah. Beautiful photos! I was in London for a long weekend the first time 'The Beast from the East' arrived. I loved seeing the snow, though it was soooo cold! It has been a very snowy year for you and New England here! But I know when your spring comes, you are going to have so much beauty to show us, Sarah! Spring has sprung here finally. Trees are blooming or budding, bulbs are up and I am able to finish cleaning out flower beds. I am so glad winter is on its way out. The shots of the beach in the snow are almost surreal. Here we are deluged with snow for a second time in a month with many roads impassable again. It's a bit frustrating! No wonder you caught a cold in such changeable weather! Your snowy photos look amazing especially so close to the sea. I guess the birds are all looking for food..I hope you can stay tucked inside listening to Irish music &enjoyiing wonderful food ... I can almost smell it from here! Sorry you have been under the weather, and what weather too! I think that this is proving to be the longest winter I can remember. You have captured some unique images for your area particularly that last one - Diana mentioned quite Nordic, and it could easily be a view of a fiord in Norway, except of course, we know it is the sea. That looks like a steep slide, down that cliff! Your pictures very much convey the cold feeling! I'm glad you were indoors with the smells of comfort food warming your souls. Oh, the cliffs with snow! But only a bit. Today we have sun, -8 ° in the night, horrible for all spring flowers. It's been the strangest March that I remember, weatherwise. Our 2nd snowstorm last weekend gave so much more than the first weekend's snow and it was bitterly cold. Thankfully all my tiny tete-a-tete have bounced back up and the tulips and iris are looking as though they've recovered well. It's been good weather for quilting! Glad to hear you are feeling better! I like the idea of sliding down the cliff like the people are doing in the photo. It must be fun to slide down a great hill like that. I still have my mouth open from reading about all the many birds you got to see, whau!!! Have a great weekend. Such beautiful photos. I miss living by the ocean. We hardly ever get snow either but had two lots the first lot very icy. I've been giving the birds extra food and love watching them especially in the snow and finding their sweet footprints. The first photo is just beautiful. Love all the birds.